Fresh for Less: Updates, Highlights and an Announcement! 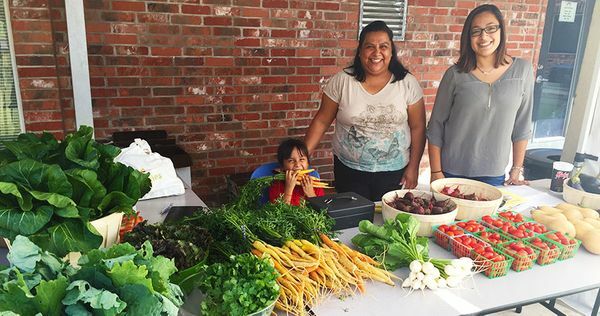 SFC’s Farm Stands, formally known as Fresh For Less Markets under the City of Austin Fresh For Less Initiative, are back in full swing with the start of the new school year! Our neighborhood-based food access sites sites have been operated and promoted by community members since 2016, and have been receiving training and support from our Food Access staff. We purchase produce directly from local farmers, and send it off to community sites to be sold at lower prices than what might be found at the farmers’ markets. This is a central piece of the Food Access work that we are currently fostering: to improve access in under-served areas of Austin. This year, we are excited to pilot another layer of community-based work by engaging community health workers, or Promotoras, to support outreach for this network of food access and Double Dollars sites. Promotoras serve as liaisons, and facilitate access and engagement with our food access efforts. We are thrilled to facilitate the development of relationships within communities in our continued effort to support peer learning and sustainability. We are excited to announce that we are piloting an effort with Farmshare Austin to make Fresh for Less Markets even stronger! Starting this Saturday, October 27th, Farmshare Austin will be launching a Fresh for Less Market at YMCA North in Rundberg! This market will run each Saturday from 9am - 11am and bring fresh, delicious, local, seasonal produce as well as local eggs and honey. It will also sell shelf-stable goods like pasta, canned beans, olive oil, and more, all at reduced prices. Austin’s YMCA North will be receiving outreach and engagement support from SFC’S Food Access Team - members of the Rundberg community who are engaged as Promotoras – who will be leading efforts at the market and in the surrounding community to increase visibility and accessibility to the market. Fresh For Less Market at YMCA North will accept SNAP and offer Double Dollars, as well as cash and credit/debit cards. Please feel encouraged to contact Simone Benz, Food Access Manager directly to learn more: simone@sustainablefoodcenter.org.